Wall mounted store Logo sign are mainly used interior area for the viewer to find store either by foot on shopping center. 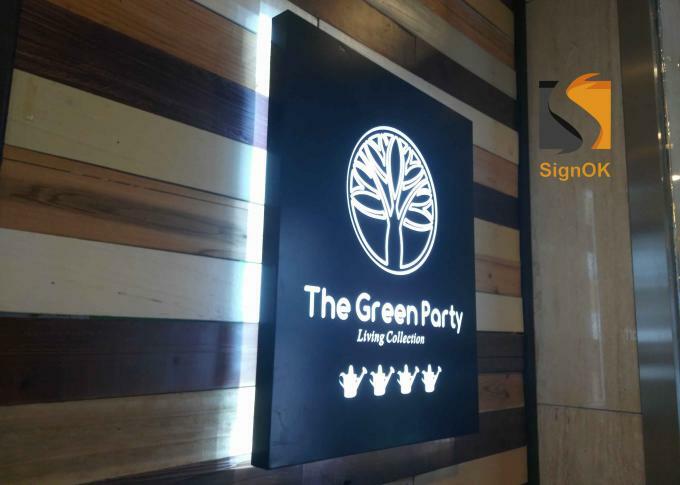 When shoppers, clients or guests arrive at a multi-tenant facility such as a mall,, an indoor store sign is often the first thing to catch attention.These displays content we can customized for you with less MOQ qty and ensure this sign is unique in the market. Box structure: 20mm super ultra thickness,galvanized iron sheet with plate beating in box shape ,then assemble 2 side in closed box. The front face with laser engraving and hollow out customized logo content. The box edge with smooth finishing. The metal box also with customized powder coated for excellent outlooks and good performance in any enviroment using. Lighting system:There are two lighting area. Frontlit area is with closed box insides to distructure LED LPG panel with LED strip for even front veiw lighting. Backlit area is closed the edge 5cm width. Also with closed frame sorround, it's with the LED moudle on the back of front metal fame, it can light the back lit effect arround the total sign edge.Whole brightness can reach 3000lux. CE or UL interior transformer can be option. 1. Cutout letter with illuminated,impressive looking. 5. Smart hanging system, easy install and safety design to prevent dropping off. When visitor close your location, the signs will show where you are and how to find your store.